Over the past decade, immigrants in the U.S. illegally have paid an estimated $100 billion in Social Security payroll taxes, even though few will ever be able to collect benefits…At least half are paying income and payroll taxes…Even if these immigrants pay taxes, they are ineligible for most federal programs. They cannot legally get food stamps, unemployment benefits, Pell grants or federal student loans. They cannot get Medicaid, except for emergency medical services, and are ineligible for subsidies under Obama’s health law. Shiites are now reacting to ISIS brutality with brutality of their own, which has been going on since “Mission Accomplished”. If people chose to ignore the fact that Shiite death squads were executing Sunnis in Iraq as soon as Saddam Hussein was out of power, that’s their choice to be ignorant. But violence begets violence and that situation forced people to turn to more violent groups like ISIS so they could take revenge for the countless murders of their friends and families. This isn’t to say it was/is right for anyone to join an extremist group or death squad. But it does show how horrible the U.S. plan for post-invasion Iraq was just an absolute disaster and there is little that can be done by the U.S. to fix this bloody situation now. And with this vicious reaction by Shiites against Sunnis, this situation is continuing to get worse. Egypt purchases military planes from France at the expense of its people. I mentioned the purchase of the Rafale fighters a few days ago but this article points out two further realities of the purchase. First, it’s not needed: “One thing is very clear,” says (Jon) Alterman (senior vice president and director of the Middle East Program at the Center for Strategic and International Studies). “On the basis of national priorities there is no military urgency to buy more combat aircraft.” Second, by spending the money on the military instead of infrastructure or social programs (clearly taking a cue from the U.S., unfortunately), this means the spending won’t go to put Egypt’s unemployed to work, which includes more than half of its citizens under the age of 25. Stupid priorities now will equal a bad situation in the future. John Boehner’s government page decided to continue the attacks on President Obama’s alleged foreign policy failures by using a curious strategy: showing how much of an idiot Boehner, himself, is on foreign policy. When Libya became leaderless, America infamously led from behind – then our posts in Benghazi were attacked. I’m assuming Boehner wanted an American invasion to sort things out in Libya, which I’m sure would have been wildly popular among the voters (not really). If only we had invaded to install a leader the U.S. liked and approved, everything would have been peaceful forever, just like in Iraq (not really). The post also fails to mention the reason Libya became leaderless was because of Obama approving airstrikes that helped oust Gaddafi. As for Benghazi, I’ll get to that. The reset button with Russia was an embarrassing failure, underscored when a hot mic caught President Obama’s assurances to Vladimir Putin that he’d have “more flexibility” after the 2012 election. In Syria, the president didn’t bother to enforce the red line he established, and then turned to Russia for a political lifeline. Emboldened, Putin muscled his way into Ukraine. First off, concerning Russia, the “flexibility” statement was technically made to Medvedev, not Putin. Splitting hairs a bit but factually inaccurate. Secondly, the Cold War ended a couple decades ago, a fact that the warfare queens on the right still ignore much of the time. The statement was regarding missile defense and taking steps away from that whole “mutually assured destruction” thing, something we should all crave from our leaders. 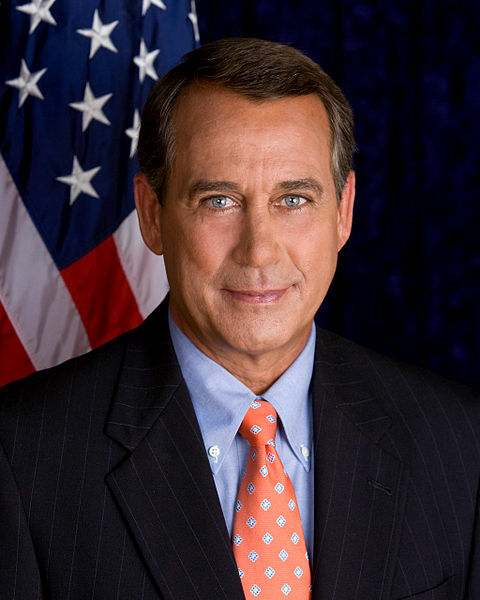 Thirdly, Boehner chooses to completely ignore something else that probably emboldened the Russians even more: the feeble reaction of the U.S. government to Russia’s invasion of Georgia. Why would he not include that? Maybe because it happened three months before Obama was elected president and five months before he took the Oath of Office. Then there is Syria. I’m assuming Boehner is ignoring the explosive Seymour Hersh article detailing why the U.S. did not attack Syria. In fact, if he wants to prove the Hersh points wrong and show we should have attacked Syria over the use of chemical weapons, he should be calling for the release of all documents showing what the CIA was doing in Benghazi prior to the attack. The post also fails to point out the Syrian regime did give up its chemical weapons under threat of increased international intervention. Then President Obama set five elite terrorist commanders free from U.S. custody. Zero mention of getting a tortured American home for this exchange. Zero mention of the Afghanistan war coming to an end and trading prisoners at the end of wars. Zero mention they were released to the custody of Qatar, not immediately set free. And if these five were so “elite”, why not ask for them to be put on trial to show how provable their elite abilities are in a court of law? Then there is the point of ISIS gaining ground in Iraq. The criticism of the decision by the Bush administration to invade Iraq on false pretenses is obviously ignored here but something else should be asked. What exactly was being done about the Shiite death squads and brutal suppression of the Sunnis in Iraq by the previous administration after the invasion? It’s as if that has nothing to do with what is happening now. Sometimes, it’s just amazing what ridiculous claims the right will make.